Professional learning to help K-12 educators choose and implement digital instructional materials is being offered by nearly half the states, according to a new report from the State Educational Technology Directors Association (SETDA). 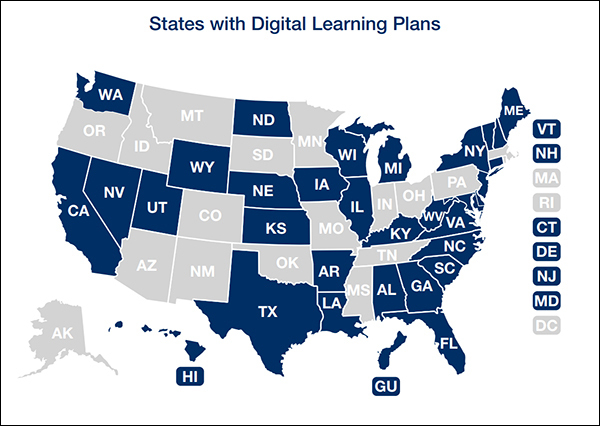 While 32 states (those in blue on the map above) have developed digital learning plans, 19 mandate that districts develop their own digital learning plans. Nine states require that students take at least one online course before graduating high school, and three states—Arkansas, North Carolina, and West Virginia—require that digital instructional materials be implemented. Many education companies want to pitch their products to principals, so that a test of a product in a single school can open doors to a district-wide purchase. But this approach can anger central-office administrators, who want product decisions routed through them. How can companies navigate the principal-central office relationship? In our April 18 webinar, we’ll take a look at how vendors can work with principals without burning bridges. Register for the webinar here. These findings are among the discoveries SETDA made as it updated its database that maps state acquisition policies for digital instructional materials. The portal is a free resource with information for educators, district leaders, policymakers, and companies. The organization’s new report is called State K12 Instructional Materials Leadership Trends Snapshot. “You can have great professional materials, but if you don’t know how to use them effectively, or make great choices on how to implement them, it’s like having a Ferrari but not knowing how to drive stick shift,” she said. 21 states provide professional learning about the implementation of digital materials. For companies, Fox said it’s worth noting that states that have a review process for instructional materials are providing more flexibility to districts to make their own choices. “Only a couple of states require those materials without an ‘opt-out’ option,” said Fox. “Nevada requires it right now, and is in the process of changing it,” said Fox, adding that the state will be adopting the model used in Louisiana. There, the state ranks materials with high, medium, or low ratings. Districts can choose materials not on the list, but they must go through the same review process used for the state’s adoption list. West Virginia won’t be reviewing materials after July 1, but will provide training and recommendations on how to review them, Fox said. This year was also the first time SETDA asked whether states have a definition of personalized learning. Ten do, and “I’m guessing there will be an uptick in that number,” Fox said. Many states are working on personalized learning, and the work done by the first ones to define it could help others interested in doing the same, she said. The nine states that now require completion of one online course before high school graduation are: Alabama, Arkansas, Georgia, Florida, Michigan, Missouri, Nevada, Utah, and Virginia. Those interested in learning about states’ latest procurement policies, review processes, and more, can access them from SETDA’s Digital Instructional Materials, Acquisition Policies for States site.